Racks with drying grapes for the production of Amarone. 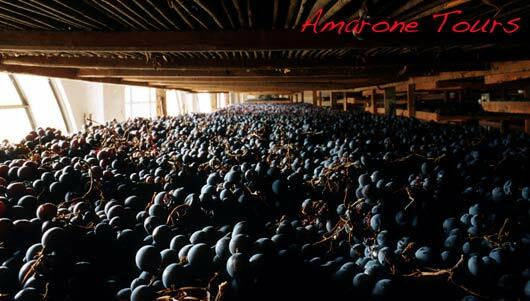 In order to better understand the history and the caracteristics of the Amarone it is important to focus on the roots of its production: the drying of the grapes. The drying of the grapes, Appassimento in Italian, is a very ancient wine making technique, still used today to make many dessert wines. Uncertain are the reasons why such a particular wine making technique, which goes back to 3500 years ago, devoloped. It was commonly believed that drying grapes helped in increasing sugar content of grapes that, due to the high production caused by Pergola (canopy) vine growing system, and by the colder climate of the past, was not enough to obtain a quality wine. There is some truth in this theory. Nevertheless very recent researches on the DNA of Corvina grape, the most important grape varietals in the blend that constitues all Valpolicella wines, discovered that stress caused by the dehydration, activates portions of the genes in Corvina that do not activate in other grape varietals, devoloping unique flavours and aromas in the resulting wine. This is the proof of how Valpolicella grapes evolved adapting not only to a very specific territory, but also to the traditional wine making techniques that develped in that territory. All the bunches, harvested between September and October, selected for the production of the Amarone have to dry for four months. In order to avoid mould and rotting during the drying process, bunches have to be perfectly healty, without any bruise and berries loosely packed to allow internal air circulation. All these elements must be taken into consideration when selcting grapes during harvest which is strictly done by hand, and therefore requires experienced staff. After the first selection, bunches have to be laid on a single layer and all in the same direction on river reeds racks, wood or plastic boxes. Like for many other traditional and manual activities, also for the slection of the Amarone grapes, people willing to learn and continue the tradition, often women, are becoming fewer and fewer. Especially during the first few weeks of drying, when bunches are still full of water and outside temperature is still high, it is important to check grapes every day, removing berries or bunches that develop mould. Few wineries are still using the traditional racks made of water reeds or bamboo, piled one on top of the other in old garrets once used also for the silkworm breeding. Water reeds have a better humidity absorption and with their round shape offer a smaller surface contact to grape berries increasing air circulation. Others producers prefer to use modern wooden or plastic boxes, which can be filled directly in the vineyards, avoiding the excessive handling of grapes. Boxes or racks are stored in loft above wineries or in specifically build houses called fruttaio, where they rest until January or February. Many wineries use still a totally natural drying system, leaving open the windows in lofts so that the wind can help the drying process. Others use temperature and humidity controlled rooms. The perfume in the drying rooms between September and January is something that is simply to hard to describe and must be experienced with a tour in an Amarone winery. Autumn is the best period of the year for a wine tour in Valpolicella. The best time of the year to visit Valpolicella with one of our wine tours is Autumn, around the end of September, begninning of October. Not only you will have the chance to experience the hectic atmoshpeare of the harvest, but it will be also possible to visit the fruttaio, the loft where the grapes for the production of Amarone are dried with the Appassimento technique. No words can describe the wonderful perfume of drying grapes. 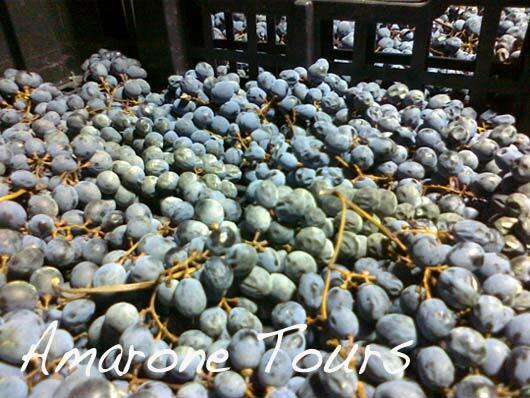 For further information about our wine tours in Valpolicella you can send us an e-mail at info@amaronetours.it or call +39 389 983 5269.